Working with different kinds of fabrics, particularly knits. Some of these have already been extensively covered on many, many other online sites. Among these: zippers, piping, working with knits, sewing around curves, different fabric types, mending. No point reinventing the wheel, so I will refer you to those sites - when I find good tutorials on specific topics, I'll link them here. Some of these can be found in books. Among these: drafting (adult slopers, collars, pants). Again, I will refer you to these books, hopefully with specific titles, which will explain them much better than I can. Some of these things I have no idea how to do, let alone teach, like interlinings. I have not worked with them yet, but when I do, I'd be happy to share what I did, and the ghastly mistakes I made. Some of these will be fun to dive into this year and next. I already have some ridiculous plans lined up, so those should keep me busy! The first was a Q&A idea: readers could send in a question/photo/problem and I could try to help. 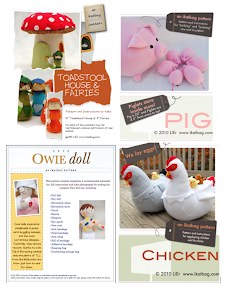 Like an agony aunt for fabric, sewing and crafts. I love it! 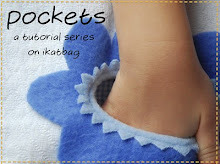 For instance, a couple years ago, I thought of having a regular feature on the blog called What Not To Sew. Readers would nominate hideous fabrics from their stash and you and I would attempt to turn them into something non-hideous. Could be very, very funny. And we all love makeovers, right? But so stressful, because some fabrics are truly so awful that they shouldn't be given a second chance. And I would be morally insincere and ethically irresponsible to the sewing community to salvage them. Plus, most of them will probably be prints i.e. you'll not get very much inspiration from me in that area. That idea went out the window quickly! But a normal Q&A thing, with actual issues we could take seriously, would be fun. Let me think a bit more about how to make this work beyond just a Help Column in which I lazily refer you to other people's sites for answers. The second was Holly's idea of learning to use commercial patterns. Now that would make an interesting experiment, like reality TV. It's so crazy I might just do it! The third was....... hm...... let me first tell you a story. I'd like you to meet BYD and SYD (pronounced Bid and Sid) - short for Big Yellow Drum and Small Yellow Drum. I've had them for years, and I used to play them - not as well as I'd like, of course. I also had a friend teach me, very casually, and I can only play the basic tumbao, which is this. 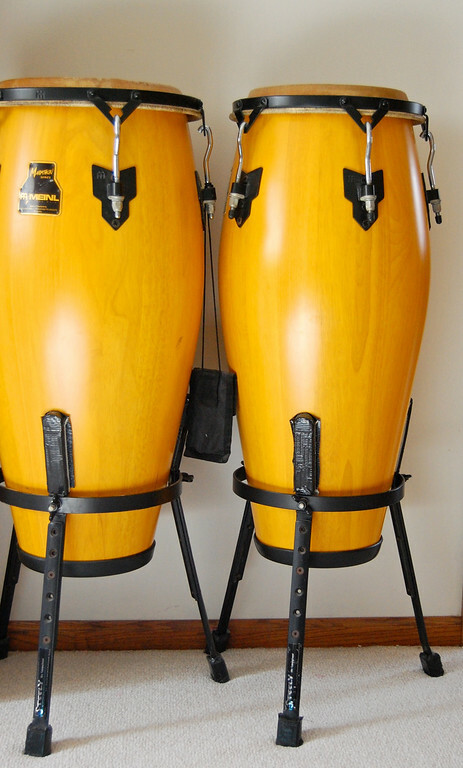 Now, I bought them because I was deeply interested in playing percussion, even though at the time the plan was to buy bongos (more portable). Instead - and I still don't know what happened - I left the music store with BYD and SYD. I remember getting home and telling my brother (plays excellent blues guitar) in a haunted sort of voice that I'd completely lost my mind. I mean, I couldn't even play the congas yet, for cryin' out loud, and I'd just spent all that money on these hulking, foreign things that would probably sit conspicuously in the corner of my room and rot. Worse, anyone who visited me and saw them would assume I was this cool percussionist chick and I'd have to disclaim, "No, no it's not like that at all!" and they still wouldn't believe me, and they'd think I was being modest, and I'd have to actually play my wretched drums to convince them that I was hopeless. (Grabbing head in claw hands) What had I doooooooooooonnnnnneeee? Miraculously, I did learn to play them. I only had two unofficial lessons that I remember, and the rest was practice, practice, practice. Eventually, I got to play them as part of the band during a couple of worship services in church. I was scared stiff, though, that the pastor would come up to me midway and whisper, "Sister, I feel led to share that the Lord would have you minister through other gifts." while looking up at the sound booth and drawing his finger across his throat. Nothing like that happened. True, nobody came up to me after the service testifying that they'd been instantaneously delivered from a crippling drug addiction by my magnificent playing, but nobody keeled over dead, either. So I kept practising the 'official' rhythms, and trying new and unorthodox things whenever I felt especially reckless. I played them because I loved how they sounded, with music and without. I played them because it was so therapeutic. I played them just because they were something utterly new that I'd never done before. Then just as I was beginning to enjoy BYD and SYD, I moved here to go to grad school. Obviously they didn't fit in my suitcase (and neither did my sewing machine) so for the next few years, even when I'd returned to Singapore, I didn't play them. We finally moved back to the US five years ago, and BYD and SYD came with us. They live in our basement now and I've started playing them again - badly (see the photo: I'd even positioned them in reverse - BYD is supposed to be on the right). On my way to the sewing room, I like to stop by and whack out a quick rhythm. Occasionally I get carried away and miss the phone or doorbell because I'm being so loud. And sometimes when I'm upstairs cooking, I mysteriously hear them, so I know the kids are thumping away, too. What is the point of this story? It's this: I am a beginner conga-player. I bought BYD and SYD in a fit of impulsiveness the way some of you might have bought your first sewing machine. I walked into the music store feeling completely intimidated by the staff and all the other bona fide percussionists sitting behind drumsets, trying them out and comparing tones and talking about snares and hi-hats and bass and brushes. I dragged a mildly musical friend along for the moral support because I had no idea what to even ask for, apart from color. And I learned to play them only after I bought them. I know one, maybe two rhythmic sequences like some of you know how to sew just one kind of seam. I don't know the terminology the way some of you don't know woven from knit. And now that my friend -the one who taught me to play, not my shopping buddy - lives in a different country and formal lessons here cost money, not to mention time away from the kids, I have only the internet for instruction. Thank goodness for youtube! Congas are much better learnt via video demos than print materials. Just like sewing. All that to say, fellow beginners, we have more in common than you think! For some of us it's fabric and zippers; for some of us, it's noisy drums. Let's keep practising and let's keep learning. We can only get better. But there's a second point. In one of the comments to that Midlife Craft Crisis post was a suggestion to go learn something from someone I admire, master it, and come back to share it here. Spot on! Instead of sewing/crafting though, I thought of BYD and SYD. Now I don't know about mastering anything, let alone sharing drum rhythms on this blog, but I do know that I have a lot of conga learning ahead of me, which is a Very Exciting Feeling. I haven't felt this same Very Exciting Feeling with sewing/tailoring/drafting/quilting in a while, in spite of all the things I still don't know about those. And frankly, the modern sewing movement -the one with all the shortcuts and elastic - while liberating in many ways, is still such a paradigm shift for me that I can't relate. Oh fuddy-duddy that I am! So it may be that I'm not going to learn a whole lot of revolutionary sewing stuff from the internet anytime soon. And I don't think a quilting circle is my thing. And knitting/crochet/brand new art form isn't what I want to invest money and space in right now. Yet my mind needs to learn something Very Thrilling to stay alive. Maybe it's time to think seriously about dressmaker's school! And I know which one costs less! I'm so excited for whatever you decide to do. I wanted to put another plug in for ethnic dress. I would love it if you talked about it a bit, even if it was in relation to a technique or something. I just feel like that is something unique you have that I haven't seen anywhere else. Also, I loved the latest post about the vet activity you did with your girls. I was so simple and so brilliant. I have convinced my own girls to play vet the last couple days. I appreciate ideas like that which aren't necessarily crafts, but are creative in their own way. Congas = exciting! My church added them to the worship band last year & I love the sound of them. Hooray for new things to learn! My "new thing" is triathlons. After 20+ years of dancing it was time for something new. Last year I joined a triathlon club & I am loving it! I'll always love dance but it's exciting to have a new activity with lots of learning & mastery yet to happen. Tutorial & book recommendations are always appreciated, I'll look forward to the links. You know L, in all the years I've known you, in all the things you've taught me, in all the time you spent (wasted) talking to me about whatever, the one thing that stands out in my mind is how effortlessly inspiring you are to us who are lucky enough to know you (yes, even to your many unmet blog readers). Maybe it's not effortless to you, maybe you take care to say and write the best things, in which case, your fellowship is all the greater. I'm grateful, L.
Ooh, I got mentioned by name! I'm so excited! :) I do hope you will give commercial patterns a try and help the rest of us (who are already blundering along with the things) figure out the best ways of using, altering and embellishing them. I *have* approached learning to sew in very much the same way you approached the drums. It's an interesting parallel because I am a musician...albeit not a percussionist...and I learned music in a much more "traditional" structured way, starting as a child. In fact, I imagine the way I learned to play musical instruments and sing is a lot more like the way you learned to sew. I can see why you bought BYD and SYD, anyway. They're lovely. Thank you for explaining how you dove into congas - verrrrrry inspiring. About the agony aunt: my color theory is that there is no ugly fabric, only fabric that isn't paired with the right fabric/color yet. I sew with "found fabric" which means I rarely go to a real fabric store and select the color I want; I get my fabric from upcycling or giveaways or freebies. So I work with a lot of rejects - and I find deep satisfaction and artistry in making them look good (in my mind - it is a matter of personal taste, after all - even the aforesaid "ugliness"). But I do love the idea of a real Q&A. That's how I learn to sew. I call my best friend with a sewing question and she talks me through it. I sooooo enjoy that you share your life with us, not just your sewing skills! It's fun just reading your posts! I love the idea of mastering something...I'm the kind of person that has so many interests that I never take time to get really good at ONE thing. Or if I'm not immediately good at something, I decide it's not for me. I think I need to change that about myself. Thanks for the inspiration! What a beautifully talented lady you are. Loved viewing all of your creations. What a super mom you are as well as passing along all the knowledge that was given to you as a child to your girls. I'm a 56 year old "Granny to 2 boys (7 & 3)and 2 girls (11 & 7). I started them "crafting" when they were 2 and we are always making something. My new adventure is felt food...so much fun! I got a Cricut for Christmas and we are loving that also. Thank you so much for taking the time to share with all of us...you're the best! !